We don’t know about you, but the older we get, the more obsessed we become with broccoli! And when you take broccoli and turn it into a soup? Perfection! 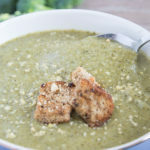 This Broccoli Soup is thick, flavourful, and delicious. If you haven’t noticed already, we are soup obsessed. It’s nearly mid-April and winter still has a firm grip on Ontario, so we are in soup heaven! Do we want warm weather? Of course. But we will make do. 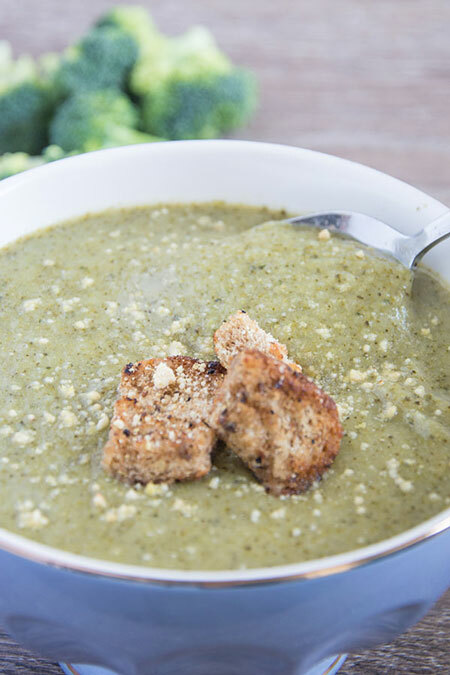 What really takes our Broccoli Soup to the next-level is the extra sprinkle of our Cashew Parmesan Cheeze. If you’re feeling super ambitious, you can also make your own croutons! Or buy them – you do you! No matter what way you decide to have this soup, warm and in your belly is the way to go. We certainly hope spring is right around the corner, but all this soup certainly eases the pain! Add olive oil to a pot and warm over medium heat. Add onion and garlic and cook until translucent, about 5 minutes. Add Broccoli, vegetable broth, almond milk, salt, and onion powder. Bring to a boil and let simmer for at least 50 minutes. Add mixture to a blender or food processor (do small batches if blender is to small). Blend until smooth or broccoli pieces are very small.